NIAGARA FALLS, Ont. – Brilliant sunshine and high temperatures welcomed Michael Mercier to the final round of the 2016 Canadian Men’s Senior Championship at Grand Niagara Golf Club. 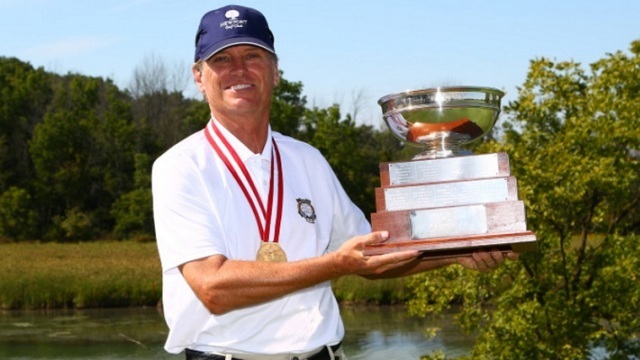 The Juno Beach, Fla., native fought through the intense heat to claim Canada’s national senior title. Mercier began the day with a share of first alongside Dave Schultz of Calgary, but a five-birdie, 2-under 70 propelled him to victory. The 58-year-old is the tournament’s 54th champion. With frequent visits to Canada and a number of ties to the country, Mercier spoke fondly of being its newest senior champion. In addition to claiming the national senior title, Mercier has earned entry into the 2016 U.S. Senior Amateur championship to be contested from September 17-22 at Old Warson Country Club in St. Louis, Mo. Despite only learning of the exemption moments after his final putt, Mercier was buoyed by the victory and looks forward to the challenge ahead. Finishing in second-place was James Gallagher of Yorktown, Va. The 58-year-old collected four birdies, but fell shy of his goal by two strokes. Claiming shares of third at 2-under were Brady Exber of Las Vegas and Camrose, Alta., native Frank Van Dornick. Van Dornick, Schultz and Brian Brown of Nanton, Alta., captured the inter-provincial team championship which was contested concurrently over the tournament’s two opening rounds. The trio claimed a nine-stroke victory over Team Manitoba. Also played alongside the championship’s first 36-holes was the Super Senior division. John Gallacher of Burnaby, B.C., posted back-to-back 72s to secure a six-stroke victory in the 65-and-over competition. The 2017 edition of the Canadian Men’s Senior Championship will be hosted at Kanawaki Golf Club in Montréal from September 11-14.